Spanish designer Armand Basi has launched Rose Lumière, a new fruity floral fragrance for women. Rose Lumière is the second in the series that began with 2011's Rose Glacée. Rose Lumière was developed by perfumer Aliénor Massenet. The notes include fruits, aquatic accord, mandarin, ivy leaves, cyclamen, rose water, water lily, white musk, cedar and sandalwood. 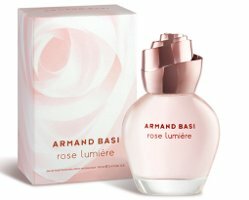 Armand Basi Rose Lumière is available in 30, 50 and 100 ml Eau de Toilette. The notes sound nice. Wouldn’t mind giving this a try. I am beginning to really appreciate fruity-florals. I have seen this brand here in Argentina, in Spain of course and also in Brasil, Colombia and Chile…. but never in the U.S.
Robin, the packaging in this brand is, in my opinion, very very nice, the bottles too. Not top-shelf…but very nice. I havent tried this one yet though… there is always hope, and this is their best packaging-bottle ever! I wish they’d make a frag with better ingredients… the prices give it away…. Thanks so much P! They have a new one for men coming out too, just haven’t announced it yet — Blue Sport or something, & it has a great bottle too. The design is pretty unique and beautiful. And as far as the scent is concerned, all those fine notes are never going to disappoint customers! Good Luck! I knew that the perfume was originally developed by Alienor Massenet. I have used Rose Lumière earlier and liked the notes of rose water, mandarin, water lily and sandalwood used in perfect combination. A nice fragrance to go for!